Addiction, obsessions…call them what you may. A typical preparation is quick and easy: Sauté an onion and some chopped garlic–we like to see chunks of garlic, but mince or even omit if you prefer. Add chopped kale and toss in the pan until wilted. Top with a touch of sea salt and ground pepper and a quick grate of nutmeg if not feeling rushed. Kale also adds a nutritious, tasty punch to many a soup recipe. Last night, however, I went for a raw creation–Kale Salad with Peanut Dressing. It was crunchy, packed with flavor, and bursting with beautiful color. My two boys gave it the double thumbs up. What’s more, wholesome meals like this help me justify a little dessert! Slice center rib out of kale leaves. Stacking several leaves at a time, cut into thin strips. 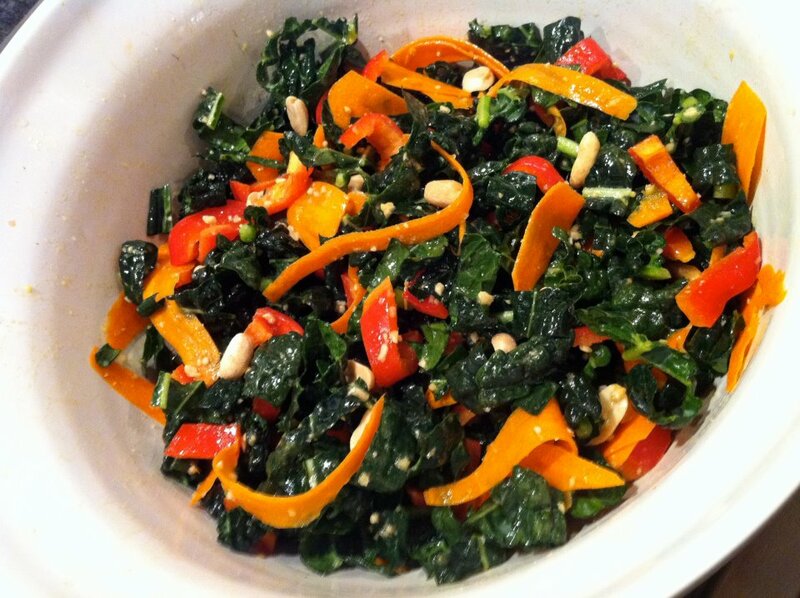 Toss kale with peppers and carrots. In chopper or food processor, pulse 1/4 cup peanuts, oil, vinegar, sugar, salt, and pepper until mostly pureed but leaving some chunkiness to the peanuts. Toss the kale mixture with the dressing and let sit for a few minutes to a few hours before serving, adding the 3/4 cup peanuts just before serving. Recipe can be halved but leftovers do keep rather well. Add a tablespoon of peanut butter to the dressing for added peanut flavor and creaminess in the dressing. For an Asian twist, drizzle with a teaspoon or two of sesame oil. I love raw organic kale in a salad. But this salad takes the cake! Can’t wait to give it a try for myself! I’m so happy you had this at a friend’s house and wanted to make it on your own. Thanks for letting me know, Angeline!